A great place for a fresh start. The Circuit introduces 3,000+ square feet of dedicated and shared work space designed for the next wave of innovators and startups in Cherokee County. Located a two-minute walk from Downtown Woodstock. Dig, Grind and Hatch your startup close to home. The Circuit introduces 3,000+ square feet of dedicated and shared work space designed for the next wave of innovators and startups in Cherokee County. 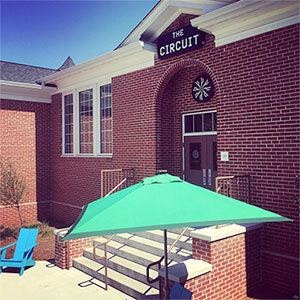 The Circuit is located in the heart of Woodstock, GA. #forgetthecommute and work close to home in a collaborative environment alongside Cherokee County’s next generation of startups and innovators. Free Wifi. Inspiring Design. Built for innovation. At The Circuit, we’ve crafted a world-class space where you can focus on what’s most important to your business or idea. The space is ready... are you? The story behind The Circuit is vital to understanding the vision for this exciting venture. The Circuit is a collaborative partnership between Chattahoochee Technical College, the Cherokee Office of Economic Development, and the Woodstock Office of Economic Development. With this unique partnership, The Circuit offers a space for Chatt. Tech students, entrepreneurs and local community to collaborate and innovate. Learn more of the backstory. The Circuit offers educational programming from its collaborative partners, including Fresh Start Cherokee, an initiative of the Cherokee Office of Economic Development designed to provide educational programming and support for startups in Cherokee County. An official Mentorship program is currently being developed with plans to launch July 1, 2019. In the meantime, we encourage an organic approach to mentorship, one connection at a time. There's always new events, networking opportunities, meetups, and workshops being added to our calendar. Come see what's going on at The Circuit! Learn from those who have done it before. The Circuit will offer formal mentorship opportunities in 2019, powerful experiences that can be invaluable for startups and growing organizations alike. Being a mentor is one of the most impactful ways you can affect your community. Apply now to find out how you can plugin and mentor the next wave of innovators in Cherokee County. The Circuit is the official student center for Chattahoochee Technical College Woodstock campus. Here, students can work, chill, learn, and collaborate with local community and entrepreneurs. It also presents the opportunity for potential internships, career opportunities and other collaboration projects to further their future and give them the tools and experience they need.